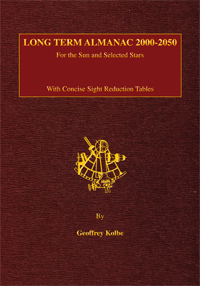 With a sextant, watch, and this book alone you can navigate worldwide till 2050, with essentially the same accuracy you would obtain with any set of tables or almanacs. For more examples and sample tables, please see these detailed notes from our online celestial navigation course where we teach the use of these tables at the end of the course. LTA annotation, examples, and forms. that we made for the Emergency Navigation book.